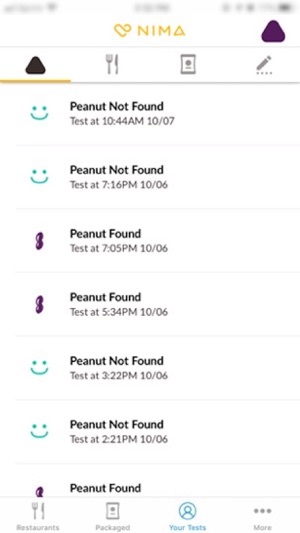 The Nima app helps you find gluten-free and peanut-free food. Hear about great restaurants or packaged foods directly from the Nima community. Each review is backed by an antibody-based chemistry test run by a Nima sensor. Real science backing real reviews, by real people just like you. 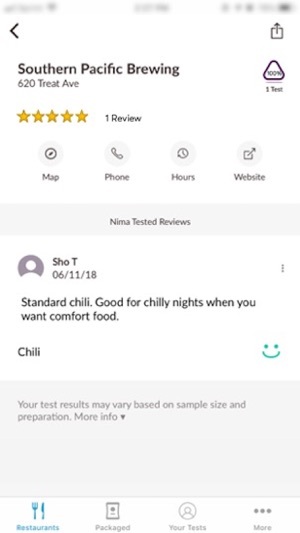 • Discover thousands of Nima-tested and reviewed restaurants across the United States. 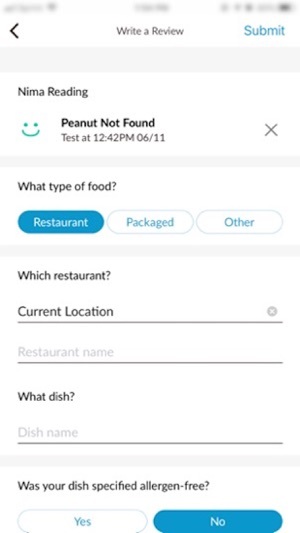 • Filter by food genre and/or location, so you can find exactly what you’re looking for. • Wondering if that bag of chips is really gluten-free? Or if the chocolate cake you’ve been eyeing contains peanuts? Search the Nima database for Nima-tested and reviewed packaged foods found in grocery stores. • Sync your Nima Sensor test results to the app. It’s quick, easy, and helps you keep a record of which foods you’ve already tested. • Share with the community. 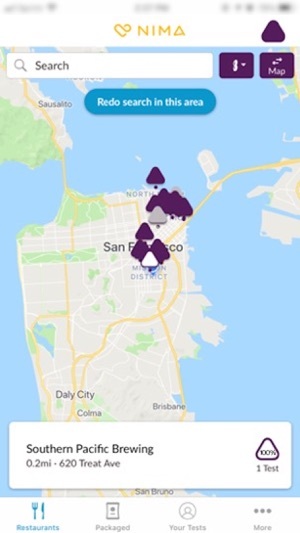 Every restaurant dish or packaged food you test and review is added to the Nima-tested restaurant map or packaged foods database. • Quickly update your sensor with the latest firmware - the software that helps your Nima run smarter and faster. 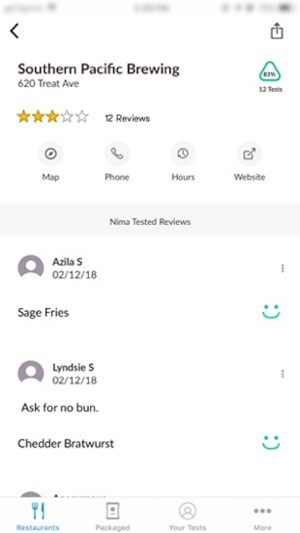 Thanks to the Nima community, who have tested and reviewed every restaurant and food item you see on the app. Together we can help others make more informed choices, and live their healthiest lives. Cheers to good and healthy food! Please send all questions and feedback to support@nimasensor.com and we'll get back to you right away. • The new Simplified Contribution flow new allows you to submit your review from a single screen. 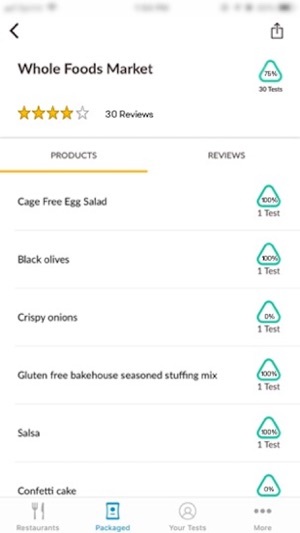 • You can now submit a review for a Restaurant, Packaged Food or Other Item without linking a Nima test. • UI updates and bug fixes. I can’t say enough how much I love my Nima! I received it as a gift last Christmas after another holiday season where my social life was negatively affected by being Celiac. It was so hard to do food focused gatherings and that is all my family does! We eat eat eat during the holidays. Or at least they did, and I watched and wished. It was hard. Really hard. Most years I would end up with gluten contact at least once. But this year has already been different. We have eaten out about 6-7 times in the last week and my Nima has gotten a workout, but it has also freed me to relax and enjoy instead of worry and stress. It has also saved me from eating an unsafe meal, which would have ruined my Thanksgiving. Thank you so much Nima! You have made it possible for me to enjoy the holidays again! I love my Nima. It gives me that extra confidence to go out to eat with my friends, and try new restaurants / dishes. There really isn’t anything else out there like Nima. The support team is also pretty awesome. They’ve been really helpful and nice anytime I’ve called in with a question. The app - is definitely one of those “the more you give the more you get” types of things. Yes, it’s not perfect and the data is still being built up. But I think it’s good for what it is right now, and I think it has potential to be an amazing (and expansive) tool in the near future! The device is a life saver but the app is garbage. Nima has opened my eyes to how much waiters don’t care/know about how their food is prepared and how it affects those with allergens. Using Nima properly is an art form and not for everyone. I take it with me everywhere and use it to guide an informed decision. As for the app, I’d skip it. It doesn’t really work. 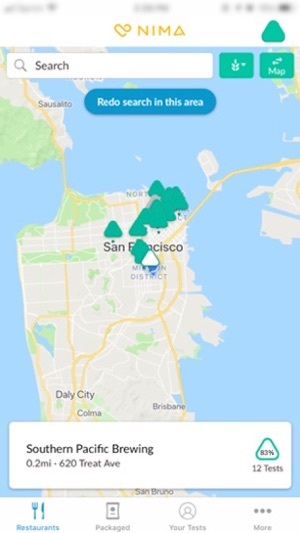 It’s never been able to properly update my device (sits at 0% forever), it doesn’t report my tests properly, and a lot of restaurants are not listed. It’s more aggravating than helpful, really, and get the feeling it was an afterthought. © 2018 Nima Labs, Inc.